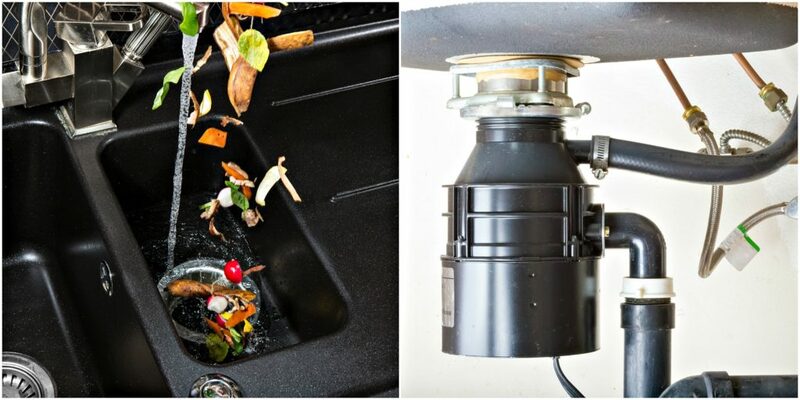 Garbage disposals are a gift to have in the kitchen to help keep your trash can smelling fresh (or at least not as bad). If you are thinking about purchasing a garbage disposal or if you already have one and are wondering what is acceptable to put through it to keep things running smoothly, than you’re in the right place. There are a couple rules for WHAT you can put down your garbage disposal and HOW exactly to do it. First things first ANY time you run your garbage disposal the water should be on. This helps push the food through your pipes as well as helps lubricate the spinning part of the disposal. So you might be wondering what temperature you have the water at while you run the disposal. Well contrary to popular belief you should always run COLD water when you’re using the GD to make sure it does not overheat. This is the best way to run the disposal, but what can you actually put down it? Small pieces or soft food – why make the disposal work any harder than it has to, if you have chocolate pudding and chopped pepper (weird combination, but is only hypothetical) throw it down the garbage disposal and as long as the water is running it should make short work of your weird meal. Plate scrapings – as long as you don’t try to shove a whole plate food down the disposal everything should go smoothly and remember, the smaller the pieces the better your disposal and pipes can handle it. Cooked meats – If you have a few small pieces of cooked chicken or pork it is okay to put them down your disposal but only if you follow the rules above. Fats and oils – although a well-known fact we have to mention that even though you have a garbage disposal any oil, grease, or fat you pour down the sink can and will most likely cause clogs. For more information on what to do when you cook bacon and have left over fat check out one of our past blogs. Non-food items – not only are non-food items not good for the sewer system, but they also are not good for your garbage disposal. So make sure to properly dispose of all twist ties, straws, forks, and bags. Celery – this might come as a surprise but foods such as celery, rhubarb, asparagus, lettuce, raw potato, and onion skins should not go down your garbage disposal as they could get caught in the blades and overheat or break your garbage disposal. Seeds and bones – lumped in together for this list is seeds and bones. Things such as turkey bones, avocado seeds, and apple cores should not be put through the disposal. These objects are too hard for the motor and can cause some serious damage. Eggshells – although controversial on whether or not it is damaging to put eggshells through the disposal we like to err on the side of caution and say that the dust that is a byproduct of the shells might harm the blades or motor of your disposal. To overview we listed a couple of dos and don’ts for what to put down your awesome new (or awesome old) garbage disposal, but as a disclaimer we should say that you should always review your user manual to make sure what you WANT to put down the drain is something that you CAN put down the drain. And remember-Even if the disposal will grind it up, the pipes may not be able to handle it.